Who doesn't want to Glow like Jennifer Lopez (my glow idol). Argan Oil, the it oil and shimmer, let's get this combination happening with Nourish The Ones You Love Argan Beauty Collection £25.00, miniature sized versions of some of their great products from the Argan range. Argan Skin Renew 15 ml, Argan Skin Rescue 5 ml and Golden Glow Illuminating Face Shimmer 15 ml. The skin renew can help you retain water so your skin isn't dehydrated, wile the skin rescue neutralises harmful free radicals and reduces the blotchiness and scarring that's associated with injury, acne, eczema and psoriasis and get your skin glowing by using the illuminating face shimmer, active tonka bean extract emits light to give the skin a vibrant, natural, healthy glow. Reduces the appearance of uneven skin tone and age spots. We've all got someone in our lives that lives in that bathtub, so why not give them something they'd truly appreciate and indulge. Aromatherapy Associates Relaxing Bath Box £35.00 it comes in a lovely presented box, the contents slide out from the box like a drawer. Showing it's contents Deep Relax, Light Relax, De-Stress Mind Bath & Shower Oils 7.5ml & Relax Body Wash, 200ml. If anything from Aromatherapy Associates is within your budget, it's definitely a gift to give others or yourself. You could always give The Star £10.00 which contains one 7.5ml bottle of their award wining Inner Strength Bath & Shower Oil. Guy's I didn't forget you, it's not all about the dolls. You also want to be prim and proper, I know. Start off your routine with this, The Refinery Essential Kit £45.00. 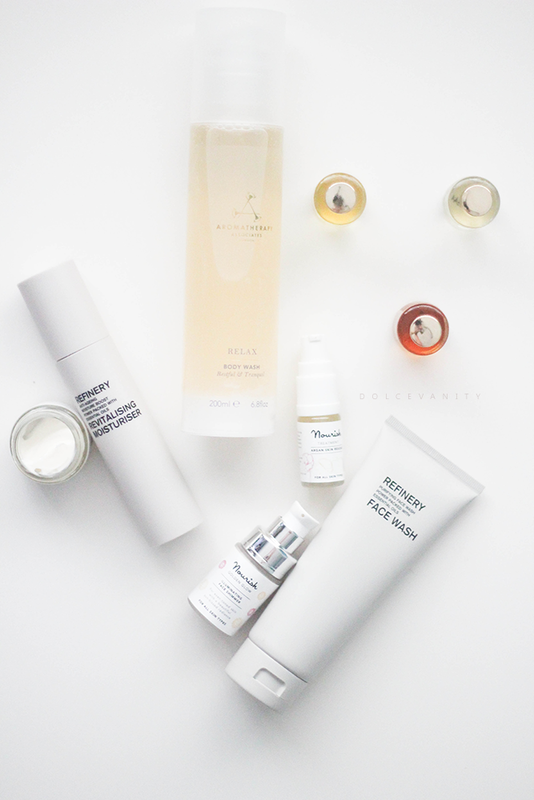 The Refinery, have a selection of skincare for men, that they'll love. Within this particular kit, there is The Refinery Face Wash 100ml, that'll remove toxins caused by environmental stress, with a combination of bergamot and spearmint, leaving him with a fresh and uplifting cleanse. The Refinery Revitalising Moisturiser 50ml with vitamins E and C with essential oils of frankincense, sandalwood and vetivert this moisturiser is rich and has lots of anti-ageing ingredients. Both gifted in a The Refinery Wash Bag. This will help to remove all impurities and nourish the skin, leaving it refreshed. You never know you might end up pinching his cleanser & moisturiser. These products have been sent to me for review. For more information, see my disclaimer.